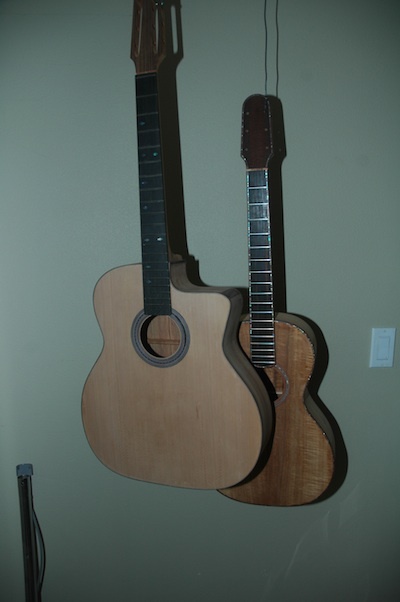 Both guitar 1002 and the Girdis completion project are ready for final sanding. This will be a 220 grit finish of every surface in preparation for the sanding sealer, pore filling, lacquer spraying. 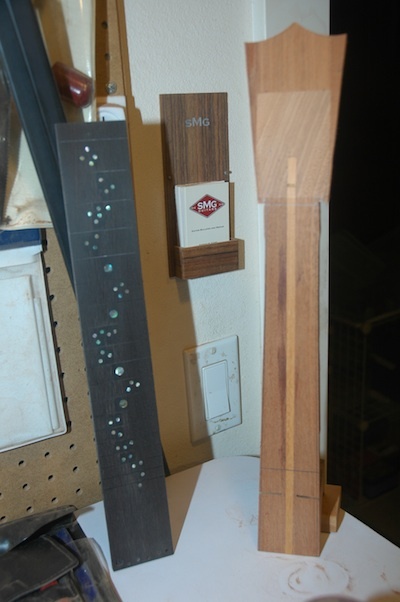 In other news, I have been working inlays for Guitar 1202’s headstock and Uke 1201’s fretboard. I spent a lot of time trying to place the fretboard shell in a random pattern. Welcome to summer. I am making plans for making progress. This summer, I have few commitments and grand plans. I spent several hours cleaning and organizing in preparation for dedicated building time. 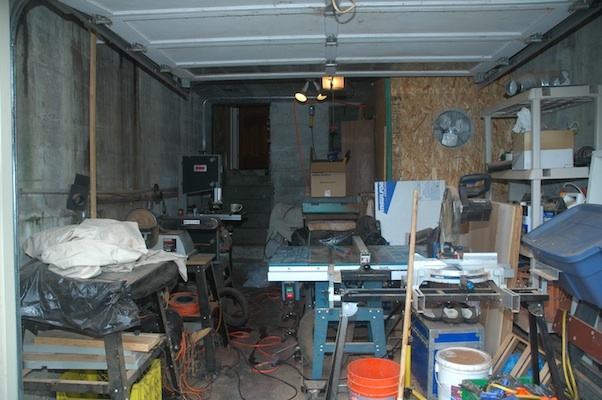 Over the past months, I have allowed my workshop to gather clutter and for the garage to collect dust and debris. 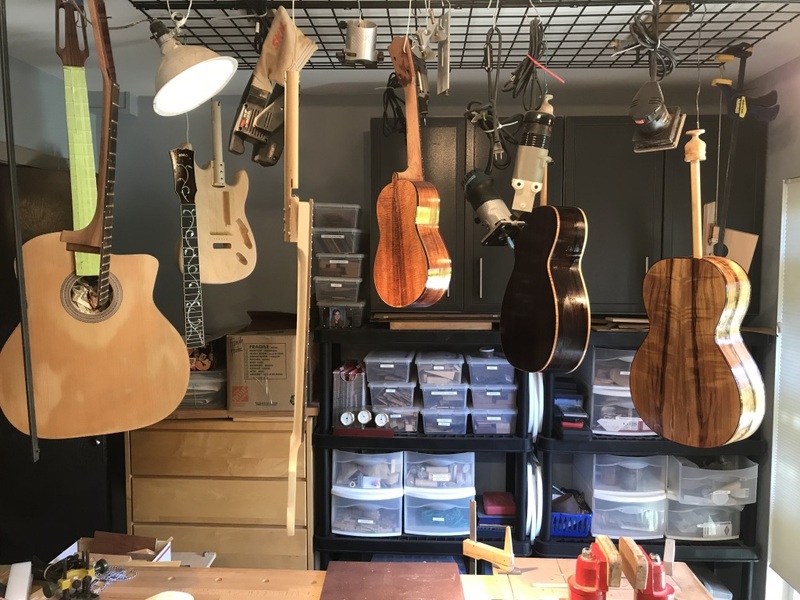 The shop has been decluttered and I have located and made an inventory of all things which are required for the 5 guitars and 1 uke which are under construction. I gutted the garage, loaded the truck for a dump run, swept and vacuumed and repositioned all the power equipment. 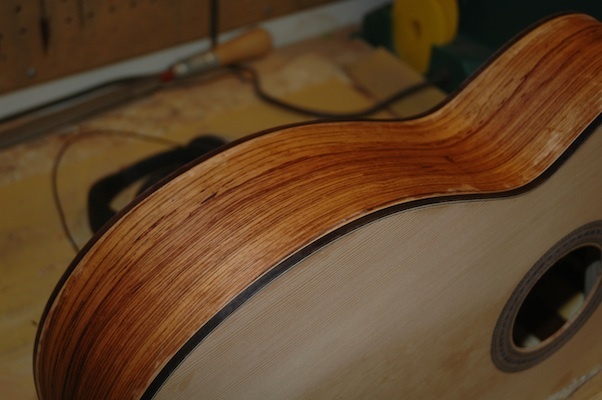 Rob Girdis Parlor – The snakewood bridge has been rough shaped and awaits finishing. The tuners have arrived and all additional components for completion have been procured. 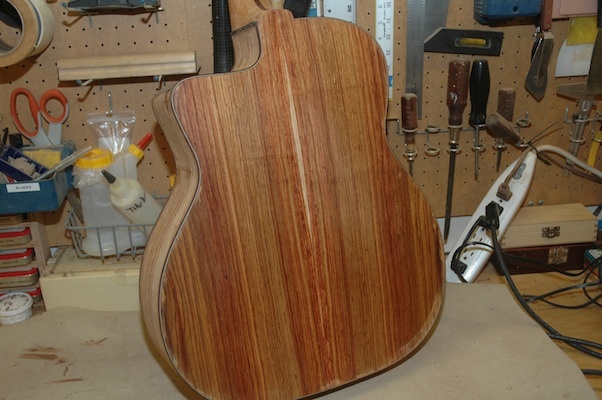 Once Guitar 1002 is ready for the spray booth, this guitar will be sealed, filled, then lacquered. 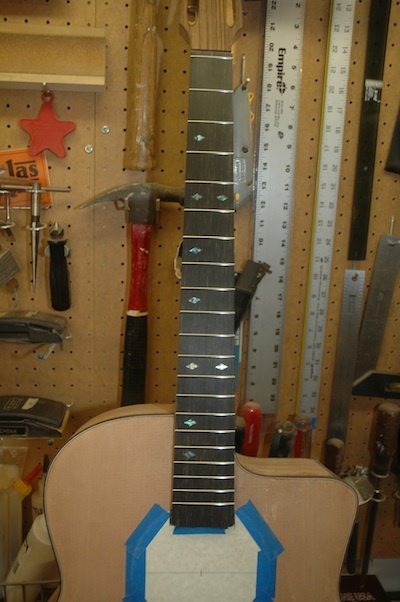 Guitar 1002 – Frets are installed and finish sanding has begun. Every day I do a bit more, until I can’t stand it any longer. It’s oh so close to being ready for the spray booth. I’m at that stage where I think I’ve got it fair and square, but there’s always more sanding to be done. I must resist the urge to finish it as is, yet dogged by future regret. 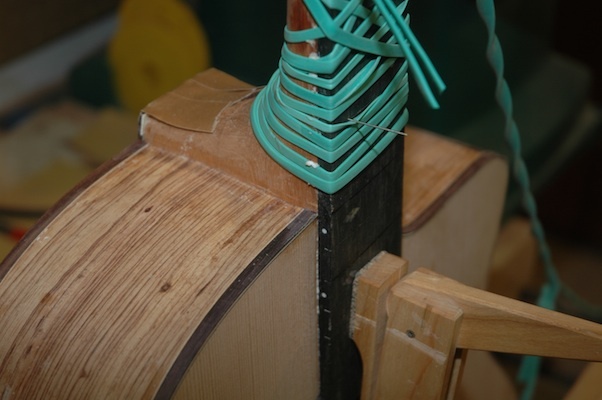 Guitar 1201 – Necks for 1201 and 1202 have been chanelled for truss rods and graphite stabilizers have been epoxied in. 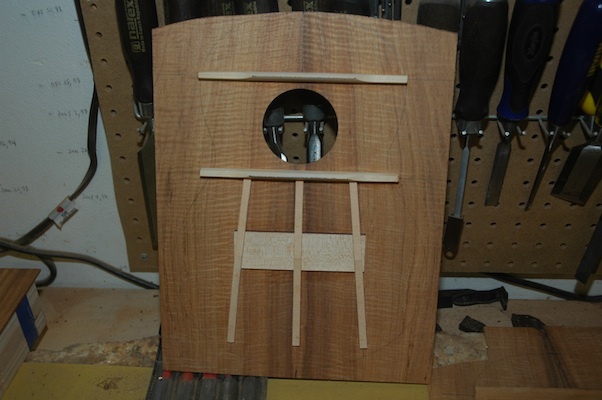 The top has been braced, and braces (mahogany) for the back have been preshaped for installation. 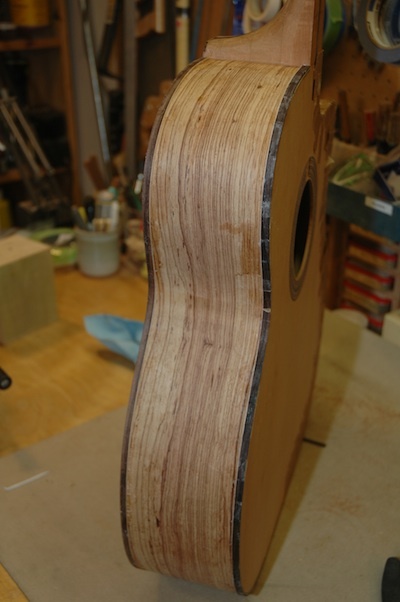 Guitar 1202 – Top joined after planing down to .110″. 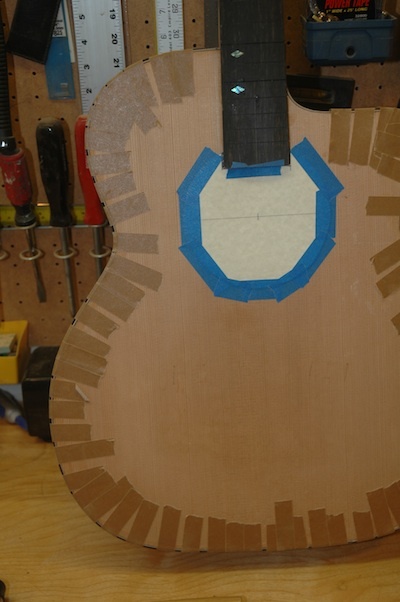 Next step install rosette and cut soundhole. Then bracing then box construction. 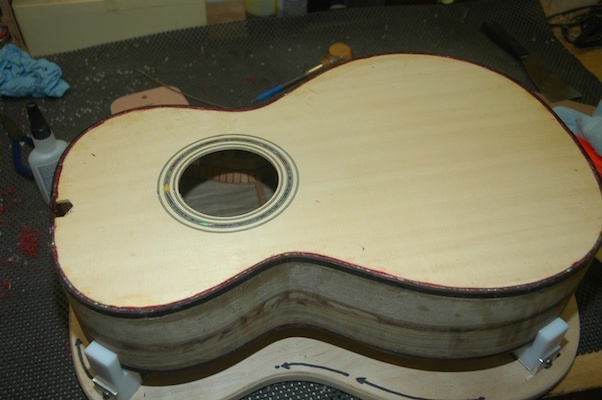 Guitar 1203 – Top join is next. Awaiting ordered graphite bars for the neck. 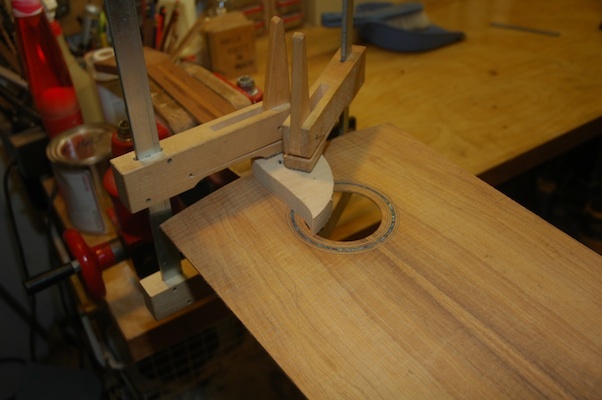 Once the Myrtle (1201) comes out of the mold, I’ll be able to thickness the sides and bend. 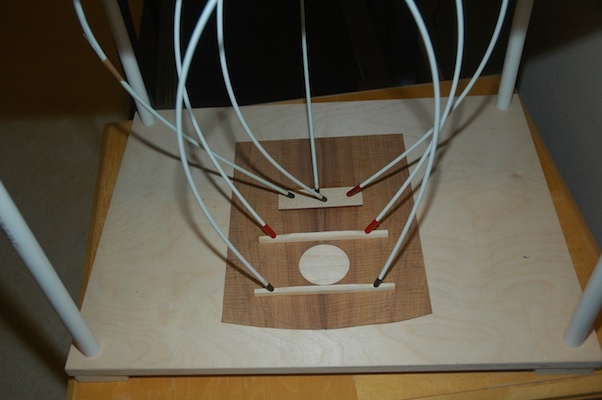 This will be a double cutaway, and my thinking is I’ll build inserts for the mold. 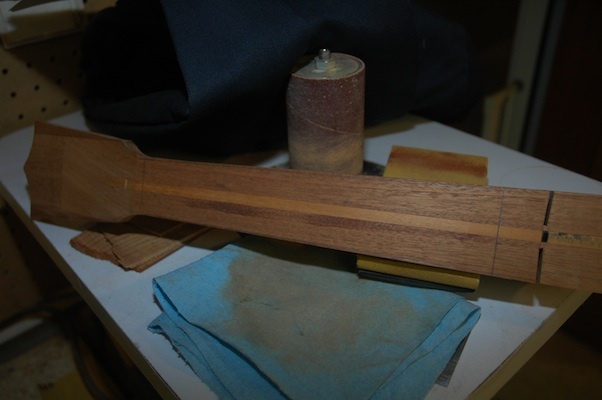 Uke 1201 – Only the neck has been tackled. 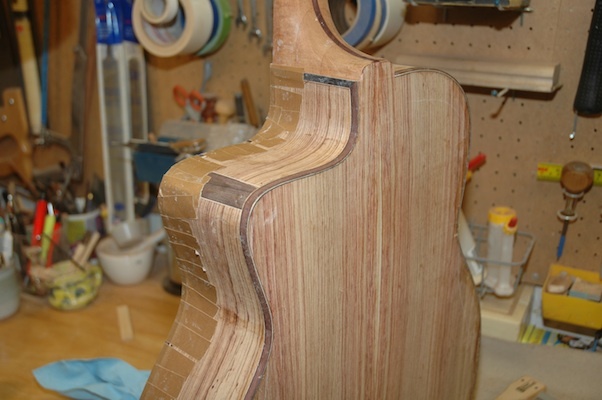 I’ll look for idle gaps between steps of above guitars to thickness/join the back and top followed by thickness/bend the sides. There’s no end to what I can work on additionally. I have a dovetail repair, some ziricote screaming to be a guitar, some master grade walnut, some bubinga for a uke, and some ovangkol. And….there’s several exploratory repairs that I owe to friends. All this to do before Guitar Camp Week 3, August 11th. Banged away on the frets this weekend. 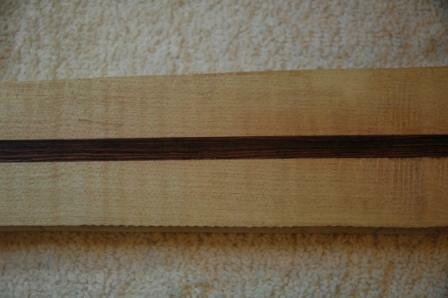 After sanding and smoothing the fretboard and cleaning out the fret slots, the frets were cut to length then tapped in place. 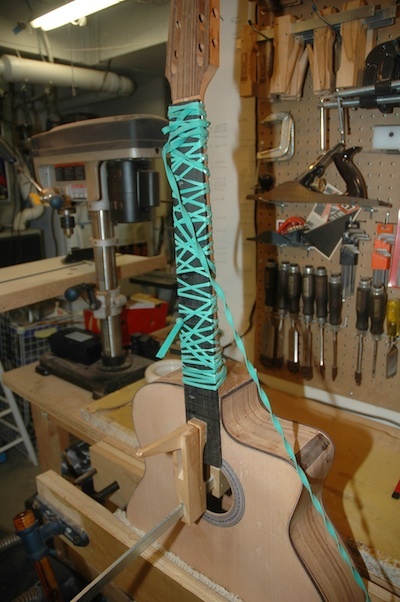 I have also been sanding away at the binding and purfling, bringing it flush to the sides. 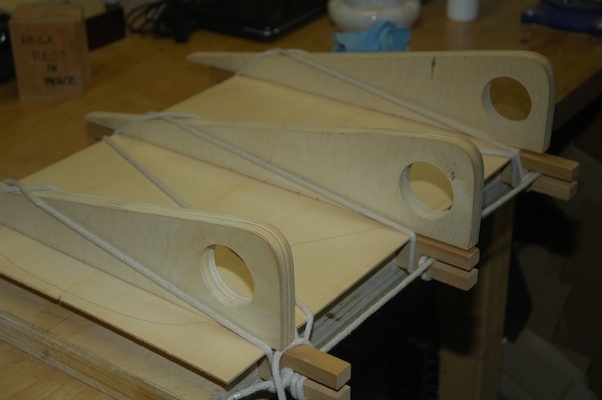 Still a lot of fairing and squaring to go before I mount the bridge and prepare for the lacquer spraying. 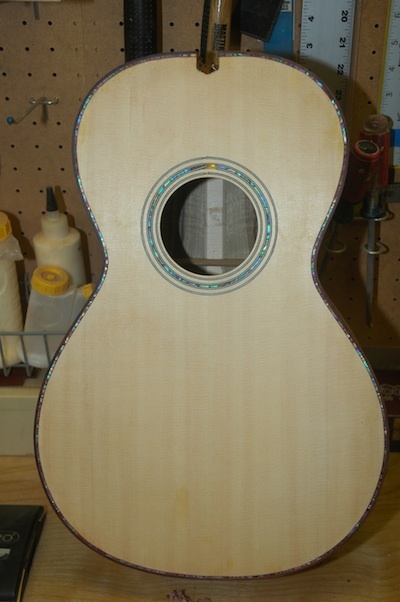 Once this guitar is ready for the spray booth, I will apply the same finish to the Girdis guitar I am finishing. I’ve rough cut the snakewood bridge in preparation for final shaping. 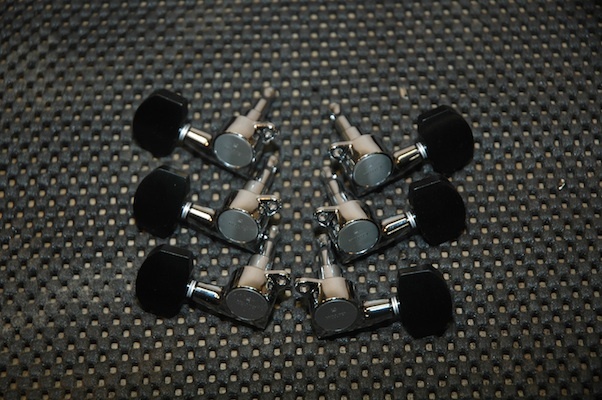 The Gotoh ebony button tuners arrived. I just wasn’t happy. The binding on the front of the guitar, the binding everyone will see and admire, was just not right. 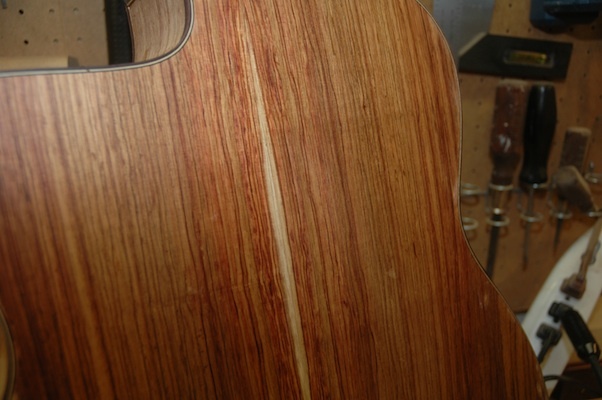 Too thin in places, poorly fitted around the cutaway, and even a few cracks that needed repair. 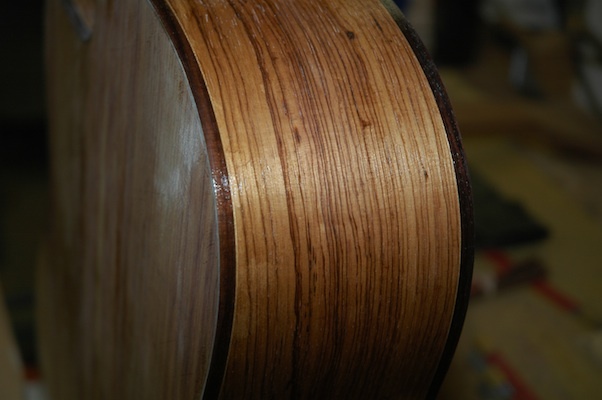 I ordered additional rosewood binding strips, which arrived yesterday, and set out on removing the first application of binding and installing it again. 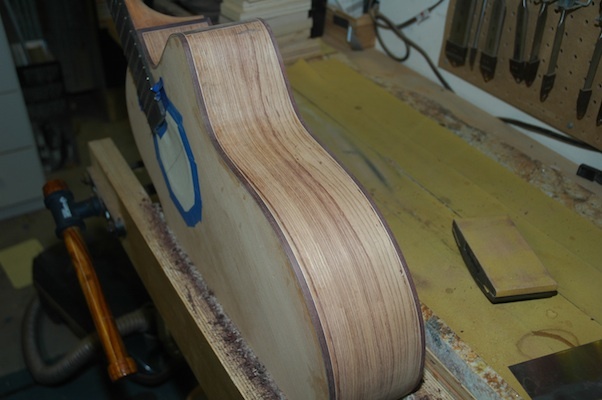 I routed out a binding channel for the top binding with a depth considerably deeper than the original. 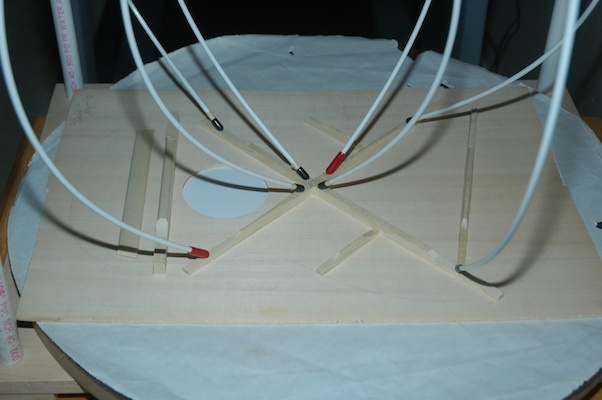 The first pass at installing this binding included thinning of the binding strips to assure a clean bend around the cutaway. What I discovered was that I could tightly bend even full width binding if I got my iron hot enough and patiently bent the binding strip a wee bit at a time. Bending, then checking, bending then checking, until I had a nice tight bend with no cracks or pullaway of wood fiber on the outside of the bend. (What I did find is that my insulated gloves don’t work as well as I would like, and my fingers are a bit crispy). A good tight bent binding and purfling make for a spectacularly easy application of the binding with binding tape. This will be way better. I am no longer afraid of the tight bend of the cutaway. 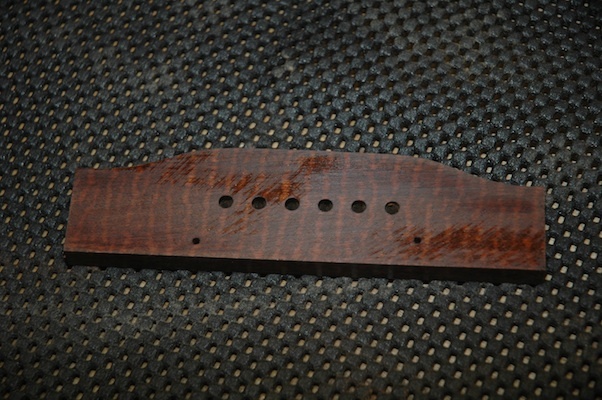 The fretboard is attached, and the long slog of finish sanding lies ahead. 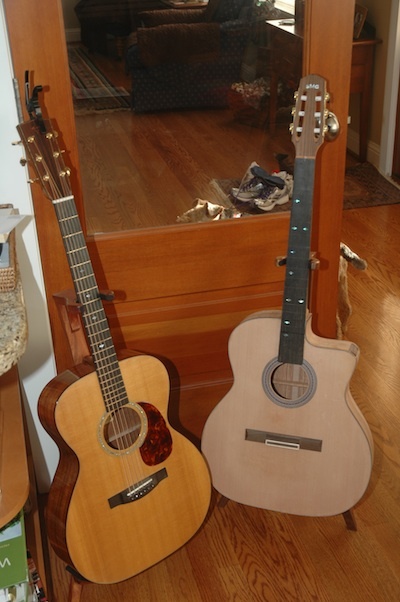 Here’s a little comparison of this Macafee style guitar next to an OM (which happens to be a Rob Girdis guitar). All binding is on and trimmed. I decided to install a rosewood heel cap and did so by routing out the heel cap material to allow installation of a maple veneer topped with rosewood cap. The heel cap will be flush with the body. 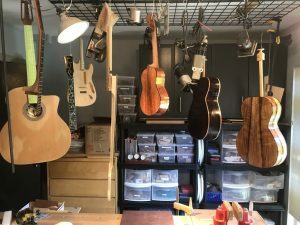 Side dots were inserted onto the fretboard, it was trimmed to match the profile of the neck, then indexing pins were located to hold the fretboard in position while it was glued and held in place with the amazing 40 foot rubber band. 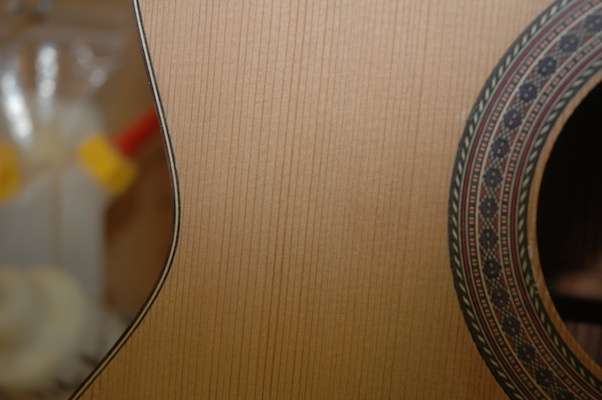 The binding, heel cap and fretboard all meet up in various spots around the guitar. Next steps will be to flush up all the joints and prepare for detailed finishing of all the surfaces. 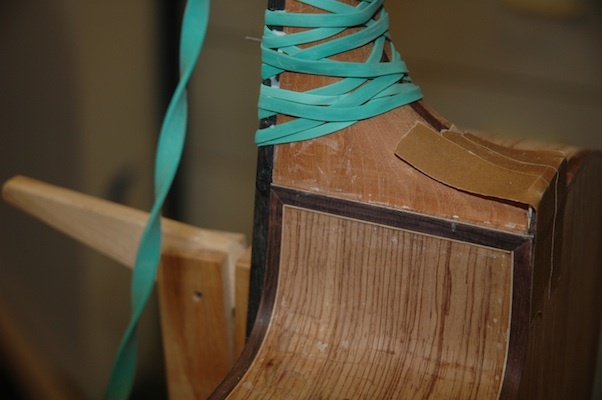 The binding is installed (save one small section on the neck heel). It’s been trimmed close to the body and now the scraping begins. 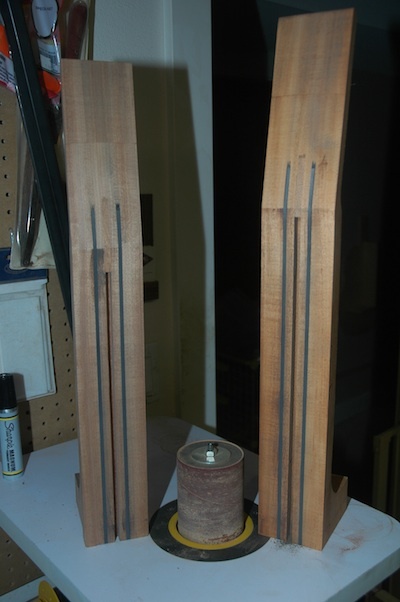 Using a cabinet scraper, nicely burnished, I’ll draw down the binding flush to the sides, top and back. I enjoy this process, yet it takes a long time to do it right. The Palo Escrito looks fine treated with naptha. The blotchy parts still need further sanding to remove the glaze of wood glue still on the surface. An hour here, an hour there, then some more here and there, and the fretboard goes on. 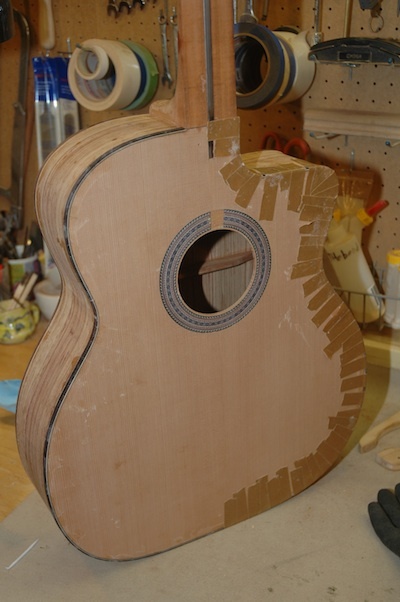 I’ve attached the cutaway side binding after hand bending. I’m pleased with the process, and am no longer flummoxed by tight binding bends. All went swimmingly, and installation was straightforward. 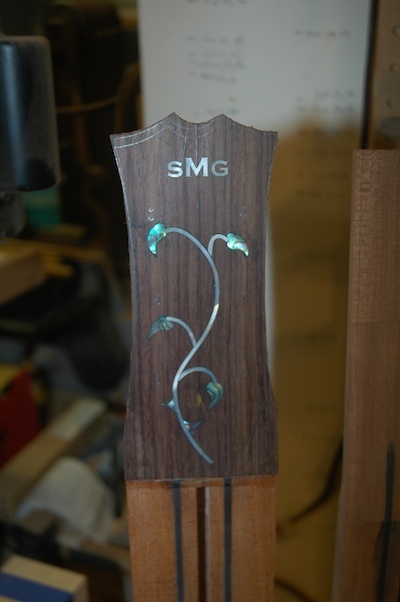 A few minor gaps which can be filled with rosewood shims. I still need to install binding and purfling around the heel cap area.